NEW YORK (AP) - Rush Limbaugh has won a children's book prize designed to be chosen by kids themselves. But that doesn't mean all of his voters were young people. 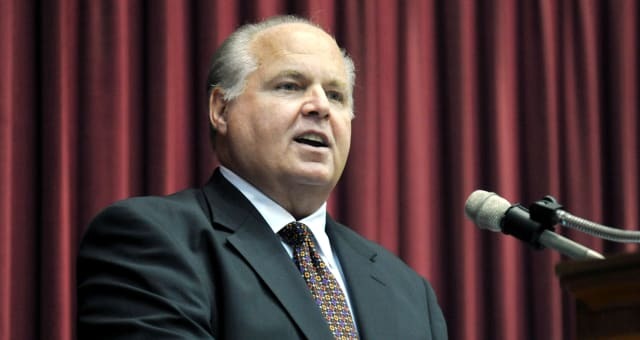 On Wednesday night, Limbaugh received the Children's Choice Book Award for author of the year, defeating such superstars as Veronica Roth, Rick Riordan and "Diary of a Wimpy Kid" writer Jeff Kinney, the winner in 2012 and 2013. The conservative commentator won for "Rush Revere and the Brave Pilgrims," a book that landed high on the best-seller lists of Amazon.com and other outlets despite limited mainstream coverage. From the moment Limbaugh's nomination was announced, in March, conservatives were delighted, liberals angered and others simply puzzled - emotions only amplified by Limbaugh's victory, which raised his book from No. 71 on Amazon the day before to the top 10 Thursday. Nominees are selected by the most objective method possible, sales, while the winners are supposedly picked by kids, who vote online. But executive director Robin Adelson of the Children's Book Council and Every Child a Reader, nonprofit organizations that co-founded the awards seven years ago, acknowledged Thursday that adults could easily vote and vote multiple times, a problem not uncommon for Internet competitions. "Every one of our finalists gets fake votes every year," Adelson told The Associated Press. "We like to think that's the enthusiasm of adults who love children's books." Adelson cited three ways that people can vote: a widget that can be embedded in such popular kids' websites as www.poptropica.com, a link on the awards website (http://ccbookawards.com) that allows individuals to vote and a link on the awards site that allows teachers, librarians and others to submit bulk votes on behalf of their institution. Adelson said she doubted that parents or other grown-ups were voting through Poptropica, but acknowledged the awards site was more likely to be manipulated. An individual voter can vote multiple times and does not need to provide a verifiable email address or proof of his or her age. Bulk voters are required to submit a verifiable email, but there is no guarantee that a given teacher or librarian is really expressing the wishes of others. "We send emails and make phone calls. A lot of manual labor goes into verifying (bulk voters)," Adelson said. "Do we catch them all? Of course not." Limbaugh has touted his nomination on his radio show and on his website, www.rushlimbaugh.com . Adelson said Limbaugh initially enjoyed a wide lead, but that voting tightened considerably in the final weeks and the outcome was "fair and close." "It's not as if he received millions of votes and everybody else and received 10," she said. "It was far, far closer." Adelson said total votes this year only increased modestly, from 1.1 million to 1.2 million, and added that voting has generally gone up each year. She emphasized the awards have no mission beyond encouraging kids to read. "We've received some hate mail," she said. "We've been accused of endorsing Rush Limbaugh and supporting Rush Limbaugh. We endorse and support children."